Posted 11:02 pm by Administrator & filed under News. 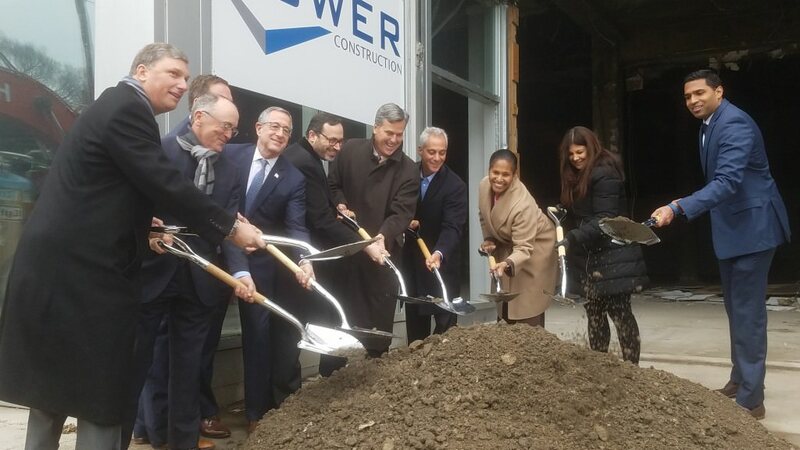 Groundbreaking of Essex on the Park took place today on the South Loop site of the new high-rise development. Mayor Rahm Emanuel, Planning Commissioner David Reifman, Building Commissioner Judy Frydland, and Alderman Sophia King joined Oxford Capital Group and Quadrum Global in a ceremony to mark the beginning of construction of the new 56-story luxury apartment building at 808 South Michigan. The $240 million project, which also includes renovation and repositioning of the historic Essex Inn hotel, is anticipated to create more than 400 jobs. The design and construction team includes Hartshorne Plunkard Architecture, Power Construction, Daccord, Halvorson and Partners, KJWW, Spaceco and Wolff Landscape. Media coverage included CBS Chicago and the Chicago Tribune.